Hi! Like I said in our post about pickles, Alex and I belong to a CSA this year. Don't know what that is, you say? A CSA is where we pay a local farm in the early spring and then all summer we get big boxes of vegetables and fruits. Last week we got a lot of apples, and I made this. I used a recipe from Joy the Baker, because she's the best. I changed a few things, like multiplying the recipe to make more because I had more apples, as well as making it gluten free and cutting the apples into little cubes so this is more like a crumble on top of a delicious applesauce. This is good both cold and hot, with ice cream. Preheat the oven to 350. Butter a 13x9" pan. 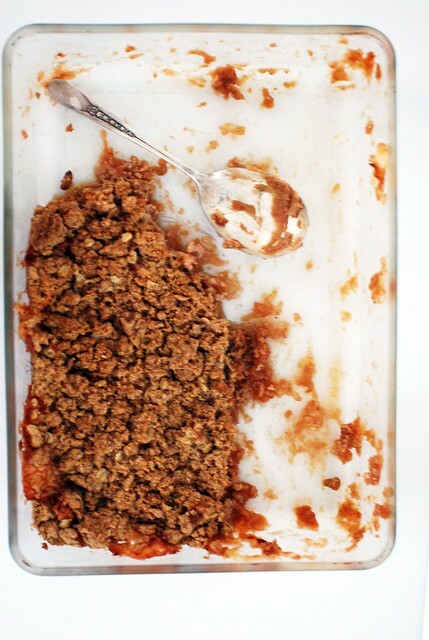 Toss the apples with the sugar and cinnamon, and spread evenly in the pan. Combine flour mix, brown sugar, cinnamon, oats and salt, then smoosh in the butter until none of the flour is dry. Sprinkle over the top of the apples, and bake 45-50 minutes, until browned on top and bubbly underneath. Makes about a million servings, or approx eight. This looks so good! Especially with that beautiful ice-cream on top. 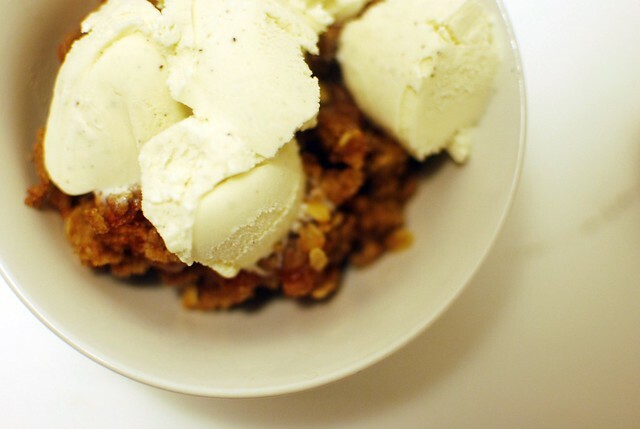 My standard apple crisp recipe is gluten free because it doesn't call for flour at all, just oats. Oats and apples were made for each other!